Contractor Wolf Hutchinson trims part of a temporary staircase to fit on Wednesday morning, June 6. 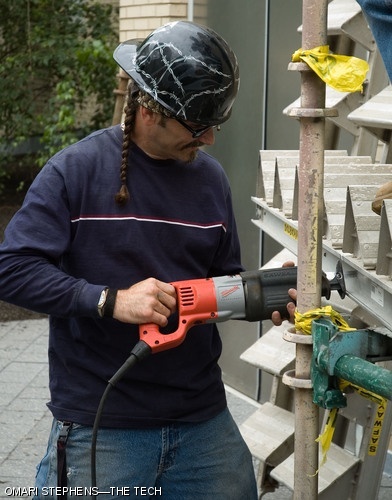 The staircase will provide access from the Stata Center's third floor outdoor plaza to ground level while the Stata Amphitheatre is closed for renovation. Amphitheatre construction, which will begin this Monday, June 11, is scheduled to finish in early September.